Are potatoes healthy? You bet they are! Overall diet quality can be improved when adults and children consume (non-fried) white potatoes. Meals that contain potatoes contain more servings of other vegetables, and are significantly higher in potassium, fiber and vitamin C.
Potatoes are a complex carbohydrate. The majority of carbohydrates in potatoes are complex carbohydrates, your body’s main energy source. Only about 20% of the potato’s nutrition is found in the skin. In fact, most of the vitamin C and potassium are found in the potato’s flesh, but that good for-you fiber is found in the skin. That’s why it’s best to enjoy every part of the spud. Potatoes can be part of a weight loss regimen. People can include potatoes in their diet and still lose weight. The results of this study confirm what health professionals and nutrition experts have said for years; when it comes to weight loss, it is not about eliminating a certain food or food groups, rather, it is reducing calories that count. Potatoes contain antioxidants. The amount and type depend on the variety of potato, but the predominant antioxidants are certain carotenoids and anthocyanins. There easy and healthy ways to prepare potatoes so they stay nutritious. Try topping a baked potato with salsa, steamed vegetables, and low-fat sour cream or Greek yogurt. Consider mashing potatoes with low-fat chicken broth. Potatoes roasted with olive oil, garlic, and a touch of herbs are delicious. For more great ideas, visit our recipe section. Potatoes are vegetables and they provide significant amounts of potassium and vitamin C. One medium-size (150g) skin-on potato contains just 110 calories per serving, has more potassium (620mg) than a banana, provides almost half the daily value of vitamin C (45 percent), and contains no fat, sodium or cholesterol. 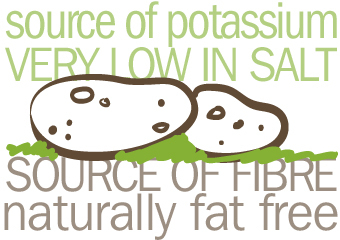 Potatoes are the largest and most affordable source of potassium in the produce department. Potatoes are one of the best nutritional values in the produce department, providing significantly better nutritional value per dollar than most other raw vegetables.Both the 2005 and 2010 USDA Dietary Guidelines identified potassium as a shortfall nutrient in the diets of Americans cut away the green portions of the potato skin before cooking and eating.